PROTECTION AND LIGHT CURTAINS, S/N EW-D22-034. 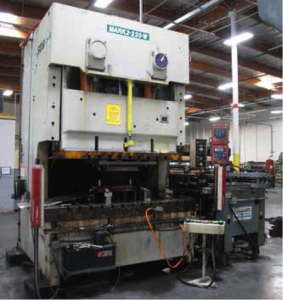 1992 AIDA NC1-150, 150 TON GAP FRAME PUNCH PRESS, VAR SPD, WINTRESS 1500 DIE PROTECTION. 1962 BLISS HP=2-100-48 X 30, 100 TON STRAIGHT SIDE PUNCH PRESS, 3’’ STROKE, 17’’ SHUT HEIGHT, 17’’ WINDOWS,3’’ SLIDE ADJ, AIR CLUTCH, WINTRESS CLUTCH/BRAKE CONTROL, S/N H51088. BLISS C-110, 110 TON OBI PUNCH PRESS, 6’’ STROKE, 4’’ SLIDE ADJ, 17’’ SHUT HEIGHT, 35-70 SPM, CUSHION, A.C. PALM BUTTONS, LIGHT CURTAINS, S/N H68337. 1965 BLISS C-75, 75 TON OBI PUNCH PRESS, 6’’ STROKE, 3.5’’ SLIDE ADJ, 15.5’’ SHUT HEIGHT, WINTRESS CURTAINS AND CLUTCH BRAKE CONTROL. 1963 BLISS C-35, 35 TON OBI PUNCH PRESS, AIR CLUTCH, 4’’ STROKE, 9.75’’ SHUT HEIGHT, 2.5’’ SLIDE ADJUSTMENT. 3) 1979, 1972, 1969 BLISS C-45 OBI 45 TON PUNCH PRESSES , 3’’ STROKE, 12.25’’ SHUT HEIGHT, A.C.
2) 1967 AND 1966 BLISS C-60, 60 TON OBI PUNCH PRESS, 4” STROKE, 14.25’’ SHUT HEIGHT, A.C.
WALSH 28X, 28 TON OBI PUNCH PRESS, AIR CLUTCH, PALM BUTTON CONTROL,3’’ STROKE, W/ WINTRESS CLUTCH/BRAKE CONTROL. FEDERAL OBI 32T, 32 TON OBI PUNCH PRESS, 2.5’’ STROKE. LARGE SE LECTION ROWE AND REGAL STRAIGHTENERS, CRADDLES, UNCOILERS AND PRESS ROOM EQUIPMENT. HAEGER 412, 4 TON INSE RTION PRESS MODEL 412-100, S/N 4HM10593. 1984 AMADA OCTO 303040, 33 TON CNC PUNCH, W/ FANUC 6M CONTROL, THIN TURRET,S/N 3340150. AMADA 78’’ X 3/16’’ MECHANICAL POWER SHEAR WITH CNC BACK GAGE. 1983 STRIPPIT FC 1000 II, 30 TON CNC TURRET PUNCH, WITH HECC 8013 CONTROL, THIN TURRET. STRIPIT AND AMADA THIN TURRET TOOLING. DORRINGER H350, 14’’ COLD SAW. MILFORD RIVETER, CLAUSING DRILL PRESSES . BOYAR SCHULTZ H612 SURFACE GRINDER. JANDA 20KVA SPOT WELDER, MODEL R20.18 WITH WELBOY 20V CONTROL. SEE DORFF 20KVA SPOT WELDER, MILLER 250DX SYNCROWAVE TIG WELDER. CHICAGO 8FT X 55 TON MODEL 68B PRESS BRAKE. TIMESAWVER 50-19M, 19’’ WILD BELT GRAINER WITH ICM DUST COLLECTOR. MITUTOYO AE-I22 CMM, W/ PEC PROBE, QC 5000 PART SOFTWARE, S/N 8601702. MULTI QUIP MC62 TUMBLER AND VARIOUS OTHER TUMBLERS. LARGE SE LECTION OF GRANITE SURFACE PLATES, INSPECTION TOOLS AND SUPPORT. TOYOTA 7FGCU30, 6000 LB LPG FORKLIFT, 3 STAGE, SIDE SHIFT, 8970 HOURS, S/N 62046. MITSUBISHI 5000 LB LPG FORKLIFT, 3 STAGE SIDE SHIFT, MODEL GC25K. KAESE R SK-15, 15 TON ROTARY AIR COMPRESSOR. ATLAS COPCO 50 HP ROTARY AIR COMPRESSOR WITH ZEKS DRYER. IR 30 TON PISTON AIR COMPRESSOR. LARGE SE LECTION OF RACKS, SHELVING AND SUPPORT.